For the Dutch coaster, see MV Begonia. Begonia is a genus of perennial flowering plants in the family Begoniaceae. The genus contains 1,795 different plant species. The Begonias are native to moist subtropical and tropical climates. Some species are commonly grown indoors as ornamental houseplants in cooler climates. In cooler climates some species are cultivated outside in summertime for their bright colourful flowers, which have sepals but no petals. With 1,795 species, Begonia is the fifth-largest angiosperm genus. The species are terrestrial (sometimes epiphytic) herbs or undershrubs, and occur in subtropical and tropical moist climates, in South and Central America, Africa, and southern Asia. Terrestrial species in the wild are commonly upright-stemmed, rhizomatous, or tuberous. The plants are monoecious, with unisexual male and female flowers occurring separately on the same plant; the male contains numerous stamens, and the female has a large inferior ovary and two to four branched or twisted stigmas. In most species, the fruit is a winged capsule containing numerous minute seeds, although baccate fruits are also known. The leaves, which are often large and variously marked or variegated, are usually asymmetric (unequal-sided). 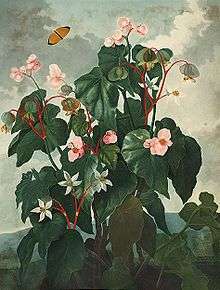 The genus name Begonia, coined by Charles Plumier, a French patron of botany, and adopted by Linnaeus in 1753, honors Michel Bégon, a former governor of the French colony of Saint-Domingue (now Haiti). The different groups of begonias have different cultural requirements, but most species come from tropical regions, so they and their hybrids require warm temperatures. Most are forest understory plants and require bright shade; few will tolerate full sun, especially in warmer climates. In general, begonias require a well-drained growing medium that is neither constantly wet nor allowed to dry out completely. 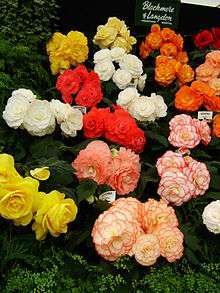 Many begonias will grow and flower year-round except for tuberous begonias, which usually have a dormant period. During this dormant period, the tubers can be stored in a cool, dry place. Begonias of the semperflorens group (or wax begonias) are frequently grown as bedding plants outdoors. A recent group of hybrids derived from this group is marketed as "Dragonwing" begonias; they are much larger both in leaf and in flower. Tuberous begonias are frequently used as container plants. Although most Begonia species are tropical or subtropical in origin, the Chinese species B. grandis is hardy to USDA hardiness zone 6 and is commonly known as the "hardy begonia". Most begonias can be grown outdoors year-round in subtropical or tropical climates, but in temperate climates, begonias are grown outdoors as annuals, or as house or greenhouse plants. Plum Paisley Begonias in a greenhouse. The nomenclature of begonias can be very complex and confusing. The term 'picotee' refers to an edging on the petals that is in contrast to the colour of the main petal, if the colours blend. If they do not, then the term 'marginata' is used, but sometimes these terms are used simultaneously. 'Non-Stop' refers to a camellia tuberous hybrid that under certain conditions will bloom 'non-stop' all year round. For the most part, these groups do not correspond to any formal taxonomic groupings or phylogeny, and many species and hybrids have characteristics of more than one group, or do not fit well in any of them. The cultivar 'Kimjongilia' is a floral emblem of North Korea. ↑ "RHS Plant Selector - Begonia (Superba group) 'Irene Nuss'". Retrieved 12 June 2013. ↑ "RHS Plant Selector - Begonia 'Burle Marx'". Retrieved 12 June 2013. ↑ "RHS Plant Selector - Begonia 'Marmaduke'". Retrieved 12 June 2013. ↑ "RHS Plant Selector - Begonia 'Mikado'". Retrieved 12 June 2013. ↑ "RHS Plant Selector - Begonia 'Munchkin'". Retrieved 12 June 2013. ↑ "RHS Plant Selector - Begonia 'Orange Rubra'". Retrieved 12 June 2013. ↑ "RHS Plant Selector - Begonia 'Ricky Minter'". Retrieved 12 June 2013. ↑ "RHS Plant Selector - Begonia 'Tiger Paws'". Retrieved 12 June 2013. ↑ "Begonia × benariensis BIG SERIES - Plant Finder". ↑ Laferrière, Joseph E. 1990. On the edibility of begonias. Begonian 57:175. Chisholm, Hugh, ed. (1911). "Begonia". Encyclopædia Britannica (11th ed.). Cambridge University Press. Wikimedia Commons has media related to Begonia. Look up begonia in Wiktionary, the free dictionary.